The Vietnamese alphabet (Vietnamese: chữ Quốc ngữ; literally national language script) is the modern writing system for the Vietnamese language. It uses the Latin script, based on its employment in the alphabets of Romance languages, in particular the Portuguese alphabet, with some digraphs and the addition of nine accent marks or diacritics – four of them to create additional sounds, and the other five to indicate the tone of each word. The many diacritics, often two on the same letter, make written Vietnamese easily recognizable. Note: Naming b 'bê bò' and p 'bê phở' is to avoid confusion in some dialects or some contexts, the same for s 'xờ mạnh (nặng)' and x 'xờ nhẹ', i 'i ngắn' and y 'i dài'. Q, q is always followed by u in every word and phrase in Vietnamese, e.g. quang (light), quần (trousers), quyến rũ (to attract), etc. The alphabet is largely derived from the Portuguese, although the usage of gh and gi was borrowed from Italian (cf. ghetto, Giuseppe), and that for c/k/qu from Greek and Latin (cf. canis, kinesis, quo vadis). /k/ /k/ ⟨k⟩ is used when preceding ⟨i ê e⟩. /t͡ɕ/ /ʲk/ /t/ Multiple phonemic analyses of final ⟨ch⟩ have been proposed (main article). Spelling used instead of ⟨g⟩ before ⟨i e ê⟩, seemingly to follow the Italian convention. ⟨g⟩ is not allowed in these environments. /h/ Unpronounced in Southern Vietnamese before /w/, except through spelling pronunciation. /k/ Spelling used instead of ⟨c⟩ before ⟨i e ê⟩ to follow the European tradition. ⟨c⟩ is not allowed in these environments. /kʷ/ /w/ Spelling used in place of ⟨co cu⟩ if a /w/ on-glide exists. Can be realized as [kʷ] in Southern speech through spelling pronunciation. /z/ /ʐ/ Is sometimes pronounced as /ɹ/ in loanwords or in informal Southern speech. /s/ /ʂ/ In Middle Vietnamese, ⟨s⟩ was pronounced [ʂ]. /v/ /j/ In Middle Vietnamese, it was represented by a b with flourish ⟨ꞗ⟩ and was pronounced [β]. ↑ This causes some ambiguity with the diphthong ia/iê, for example gia could be either gi+a [za ~ ja] or gi+ia [ziə̯ ~ jiə̯]. If there is a tone mark the ambiguity is resolved: giá is gi+á and gía is gi+ía. The correspondence between the orthography and pronunciation is somewhat complicated. In some cases, the same letter may represent several different sounds, and different letters may represent the same sound. This may be because the orthography was designed centuries ago and the spoken language has changed, or because the inventors were trying to spell the sounds of several dialects at once. The letters y and i are mostly equivalent, and there is no concrete rule that says when to use one or the other, except in sequences like ay and uy (i.e. tay ("arm, hand") is read /tɐj/ while tai ("ear") is read /taːj/). There have been attempts since the late 20th century to standardize the orthography by replacing all the vowel uses of y with i, the latest being a decision from the Vietnamese Ministry of Education in 1984. These efforts seem to have had limited effect, in part because some people bristled at the thought of names such as Nguyễn becoming Nguiễn and Thúy (a common female name) becoming Thúi (stinky), even though the standardization does not apply to diphthongs and triphthongs and allowed exceptions to proper names. In textbooks published by Nhà Xuất bản Giáo dục ("Publishing House of Education"), y is used to represent /i/ only in Sino-Vietnamese words that are written with one letter y alone (diacritics can still be added, as in ý, ỷ), in words that start with the letter y (such as yếm, yết), and after u; therefore such forms as *lý and *kỹ are not "standard", though they are much preferred elsewhere. Most people and the popular media continue to use the spelling that they are most accustomed to. a /aː/, [æ] in some dialects, /a/ before "u" and "y", /ə/ in "ia" /iə/ o /ɔ/, /aw/ before "ng" and "c"; /w/ before "a", "ă" and "e"
ă /a/ ô /o/, /əw/ before "ng" and "c" except "uông" and "uôc"
usually written i: /si/ = sĩ (A suffix indicating profession, similar to the English suffix -er). sometimes written y after h, k, l, m, s, t, v: /mi/ = Mỹ 'America'. at the beginning of a word derived from Chinese (written as i otherwise): /ʔiəw/ = yêu 'to love'. The vowel /ɔ/ is written oo before c or ng (since o in that position represents /aw/): /ʔɔk/ = oóc 'organ (musical)'; /kiŋ kɔŋ/ = kính coong. This generally only occurs in recent loanwords or when representing dialectal pronunciation. Similarly, the vowel /o/ is written ôô before c or ng: /ʔoŋ/ = ôông (Nghệ An/Hà Tĩnh variant of ông /ʔəwŋ/). But unlike oo being frequently used in onomatopoeia, transcriptions from other languages and words "borrowed" from Nghệ An/Hà Tĩnh dialects (such as voọc), ôô seems to be used solely to convey the feel of the Nghệ An/Hà Tĩnh accents. In transcriptions, ô is preferred (e.g. các-tông 'cardboard', ắc-coóc-đê-ông 'accordion'). yê: /xwiən/ = khuyên 'to advise'; /iən/ = yên 'calm'. uô before a consonant: /muən/ = muôn 'ten thousand'. ươ before consonants: /mɨəŋ/ = mương 'irrigation canal'. The hook indicates that the speaker should start somewhat low, and fall in Northern Vietnamese, but the speaker should start somewhat low, and fall, then rise (as when asking a question in English) in Southern Vietnamese. A tilde indicates that the speaker should start mid, break off (with a glottal stop), then start again and rise like a question in tone. The dot signifies that the speaker should start low and fall lower in tone, with the voice becoming increasingly creaky and ending in a glottal stop in Northern Vietnamese, but Southern speakers starts low and rise mid in tone. In syllables where the vowel part consists of more than one vowel (such as diphthongs and triphthongs), the placement of the tone is still a matter of debate. Generally, there are two methodologies, an "old style" and a "new style". While the "old style" emphasizes aesthetics by placing the tone mark as close as possible to the center of the word (by placing the tone mark on the last vowel if an ending consonant part exists and on the next-to-last vowel if the ending consonant doesn't exist, as in hóa, hủy), the "new style" emphasizes linguistic principles and tries to apply the tone mark on the main vowel (as in hoá, huỷ). In both styles, when one vowel already has a quality diacritic on it, the tone mark must be applied to it as well, regardless of where it appears in the syllable (thus thuế is acceptable while thúê is not). In the case of the ươ diphthong, the mark is placed on the ơ. The u in qu is considered part of the consonant. Currently, the new style is usually used in textbooks published by Nhà Xuất bản Giáo dục, while most people still prefer the old style in casual uses. The Vietnamese language was first written down, from the 13th century onwards, using variant Chinese characters (chữ Nôm 字喃), each of them representing one word. The system was based on the script used for writing classical Chinese (chữ nho), but it was supplemented with characters developed in Vietnam (chữ thuần nôm, proper Nom characters) to represent native Vietnamese words. As early as 1527, Portuguese Catholic missionaries in Vietnam began using Latin script to transcribe the Vietnamese language for teaching and evangelization purposes. These efforts led eventually to the development of the present Vietnamese alphabet, started by the Jesuit Portuguese priest Francisco de Pina. His work was continued by the French Jesuit Alexandre de Rhodes, who worked in the country between 1624 and 1644. 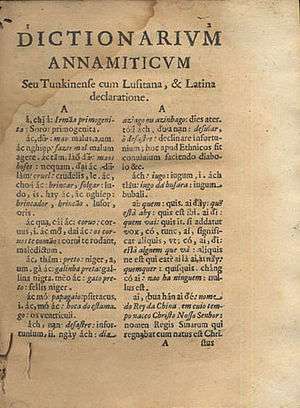 Building on previous Portuguese–Vietnamese dictionaries by Gaspar d'Amaral and fellow Jesuit Duarte da Costa, Rhodes wrote the Dictionarium Annamiticum Lusitanum et Latinum, a Vietnamese–Portuguese–Latin dictionary, which was printed in Rome in 1651, using his spelling system. Later on, under French rule in the late 19th century, missionaries often saw the Confucian literati as the main obstacle to Catholic conversion in Vietnam, hence the elimination of the Chinese language was also regarded as a means for isolating the Vietnamese from its heritage and instrumental in neutralizing its traditional elite. Historian Pamela A. Pears asserted that the French, by instituting the Roman alphabet in Vietnam, cut the Vietnamese off from their traditional literature, rendering them unable to read it. The French colonial authorities adopted the quoc ngu romanized phonetic script in Cochin China as early as 1860 with a view to breaking the links to the Chinese writing tradition the local elites had used, so cutting off new generations from their previous literature and, as a colonial official put it, "expose the Vietnamese only to French" influence. Accordingly, another aim of the newly established French educational system in Indochina consisted of creating a French-speaking and French-writing acculturated indigenous elite prone to serve the colonial rulers in the administration. The French colonial education system was based in the east of Indochina, and in that context the Tonkin Free School flourished fleetingly, set up by nationalists in 1907, and adopting the alphabetic script. By 1917, the Confucian examination system was suppressed, so convincing the Vietnamese elites of the need to educate their offspring in in French language education system. That, however, did not satisfy French colons, who demanded exclusive educative establishments. The colonial regime then came up with the idea of setting up an educational system for natives with quoc ngu Vietnamese as first language in primary school, but French as second language, via quoc ngu. Hundred of thousads of text books for primary education started to be published in quoc ngu with the result of unintenionally turning the script into the popular medium for the expression of Vietnamese cultural (and national) solidarity. By the late 1930s, approximately 10% of the population was literate, a huge rate when compared to several decades before. However, the expansion of this alphabet was not without conflict with other peoples inhabiting Indochina, like the Khmer Krom. Because the period of education necessary to gain initial literacy is considerably less for the largely phonetic Latin-based script compared to the several years necessary to master the full range of Chinese characters, the adoption of the Vietnamese alphabet also facilitated widespread literacy among Vietnamese speakers—whereas a majority of Vietnamese in Vietnam could not read or write prior to the 20th century, the population is now almost universally literate. 'Despite conflicts over the meaning of Vietnamese nationalism during the Vietnam War, as both sides sought to define themselves as the true national government, neither side attempted to promote a new and separate writing system or revert to Chinese characters. Prior to the advent of 21st-century computer-assisted typesetting methods, the act of typesetting and printing Vietnamese had been described as a "nightmare" due to the number of accents and diacritics. Writing Sino-Vietnamese words with quốc ngữ caused some confusion about the origins of some terms, due to the large number of homophones in Chinese and Sino-Vietnamese. For example, both 明 (bright) and 冥 (dark) are read as minh, which therefore has two opposite meanings (although the meaning of "dark" is now esoteric and is used in only a few compound words). Perhaps for this reason, the Vietnamese name for Pluto is not Minh Vương Tinh (冥王星 – lit. underworld king star) as in other East Asian languages, but is Diêm Vương Tinh (閻王星), named after the Buddhist deity Yama. During the Hồ Dynasty, Vietnam was officially known as Đại Ngu (大虞 – Great Yu). Most modern Vietnamese know ngu as "stupid" (愚); consequently, some misinterpret it as "Big Idiot". In this case, "Ngu" means peace and joy. However, the homograph/homophone problem is not as serious as it may seem, because although many Sino-Vietnamese words have multiple meanings when written with quốc ngữ, usually only one has widespread usage, while the others are relegated to obscurity. Furthermore, Sino-Vietnamese words are usually not used alone, but in compound words; thus, the meaning of the compound word is preserved even if individually each has multiple meanings. Most importantly, since quốc ngữ is an exact phonemic transcription of the spoken language, its understandability is as high or higher than a normal conversation. Unicode allows the user to choose between precomposed characters and combining characters in inputting Vietnamese. Because, in the past some fonts implemented combining characters in a nonstandard way (see Verdana font), most people use precomposed characters when composing Vietnamese-language documents. Language Monthly, Issues 40-57. Praetorius. 1987. Retrieved 24 April 2014. ↑ Haudricourt, André-Georges. 2010. “The Origin of the Peculiarities of the Vietnamese Alphabet.” Mon-Khmer Studies 39: 89–104. Translated from: Haudricourt, André-Georges. 1949. “L’origine Des Particularités de L’alphabet Vietnamien.” Dân Viêt-Nam 3: 61–68. 1 2 Roland Jacques (2002). Portuguese pioneers of Vietnamese linguistics prior to 1650. Orchid Press. ↑ Jakob Rupert Friederichsen Opening Up Knowledge Production Through Participatory Research? Frankfurt 2009 [6.1 History of Science and Research in Vietnam] Page 126 "6.1.2 French colonial science in Vietnam: With the colonial era, deep changes took place in education, communication, and ... French colonizers installed a modern European system of education to replace the literary and Confucianism-based model, they promoted a romanized Vietnamese script (Quốc Ngữ) to replace the Sino-Vietnamese characters (Hán Nôm)"
↑ See for example Lê Bá Khanh; Lê Bá Kông (1998) . Vietnamese-English/English-Vietnamese Dictionary (7th ed.). New York City: Hippocrene Books. ISBN 0-87052-924-2. ↑ Jacques, Roland (2006). Portuguese pioneers of vietnamese linguistics. Bangkok: Orchid Press. ISBN 9748304779. ↑ Pamela A. Pears (2006). Remnants of Empire in Algeria and Vietnam: Women, Words, and War. Lexington Books. p. 18. ISBN 0-7391-2022-0. Retrieved 2010-11-28. ↑ Emperor Khải Định declared the traditional writing system abolished in 1918. ↑ Wellisch 1978, p. 94. ↑ "Language Monthly, Issues 40-57" 1987, p. 20. ↑ Sassoon 1995, p. 123.